I made a fatal mistake. It had good intentions of course, as most do. You see, I have been trying this new positive thinking thing, where instead of hiding from things I’d really like to do, but am too afraid to because I’m afraid of what people think, I just do them and enjoy myself. Like say, the beach. I love the beach. Well, I love the ocean, not the sand. 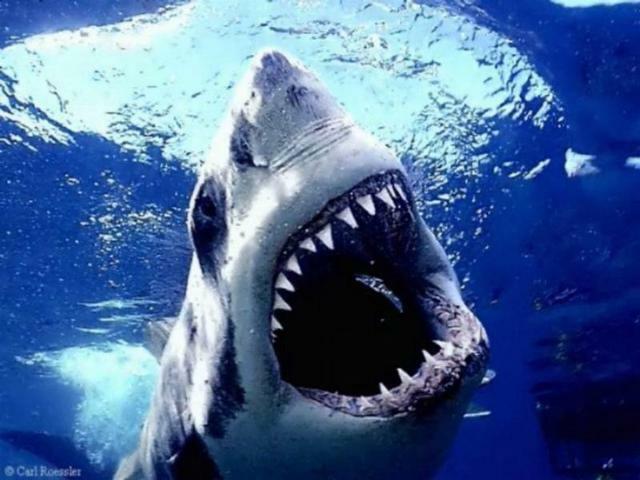 Well, I’d love the ocean if it didn’t have sharks, jellyfish, eels, pee, and things with teeth in it. Alright fine, I love the idea of the beach. I also love being able to eat watermelon without worrying about it getting on me and spitting the seeds all over while getting a tan, and the beach is the most convenient setting for that. Despite this “love” I rarely go to the beach though, because beach=bathing suit and bathing suit=skin showing that I’d rather have covered 24/7 in a burka than anyone see. Was that racist? Hope not. Like rock climbing, bike riding, slam poetry, and group sports, going to the beach is something I’ve always wanted to feel comfortable doing, but never have. Well! Times are changing! I decided instead of having a quarter life crisis at 25 where I decided to quit my job and follow Justin Bieber around Europe (tickets too expensive) I was going to start living my life without fear! Seize the Carp as they say in France! So for the first time since I was a wee thing (alright I was never a wee thing) I bought a bathing suit that wasn’t black/made specifically to hide some flaw/worn by most 80 yr old’s at the pool. True story, one time I was at the neighborhood pool where I worked, and this granny walked by in the exact same ruffled/ruched/hideous black bathing suit I was wearing. Talk about mortifying! I decided this year that that would not happen to me anymore, no, I would find a bathing suit that I liked and thought was pretty and buy it, not for its camouflaging properties, but for its style. I even went crazy and bought on online without trying it on, which I gotta say was a brilliant idea. 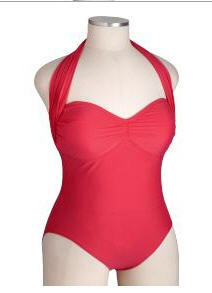 I don’t think you ever, ever look worse in a bathing suit than you do under fluorescent lights in a dressing room. Spitfire is red. A crisp, refreshing, I might even say, Kool red. A red so Kool that it might even Aid in me having a great time. That’s right folks. 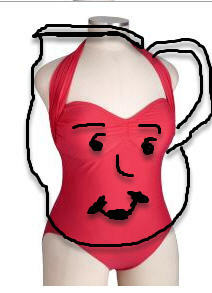 I bought a bathing suit the exact color of Mr. Kool-Aid. And I’m fat. I can’t win! I just can’t win. Here’s a picture of the suit as I saw it, and my artists rendition of how I imagine the kinds of people who make up “yo mama” jokes might see it. Oh well. I’m still going to the beach Sunday, maybe I’ll play along and burst through sand castles all day holding a pitcher. It could be fun!! One Response to OH Yeah!!! i am laughing so, so hard in my cube right now. you are wicked funny, emily. and i’m fairly certain you don’t look like Mr. Kool Aid.